A recent evaluation of our Well-being programme found that volunteering had a significant positive impact on the well-being of volunteers. In this guest blog, Age UK‘s Flavia Blows tells us about one of the 4,500 volunteers who have contributed hundreds of hours of their time to Lottery-funded Fit as a Fiddle projects. Fit as a Fiddle is a programme of 26 projects working with over 400 community organisations. 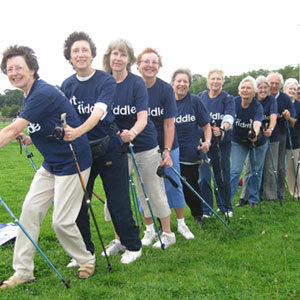 It has delivered new and innovative activity sessions for older people, from Wii computer sessions to Nordic Walking clubs. Norma, aged 65, became aware of the Fit as a Fiddle programme when looking for activities for her 93-year-old father. As well as finding a range of activities for him, Norma joined in activities which took her out of her comfort zone. She even had a go at activities as varied as crate climbing and abseiling. Norma has now become a volunteer and is a real asset to the Age UK Teesside Fit as a Fiddle group. She mentors other older people at the activities she attends. “Joining Fit as a Fiddle has changed my life around,” says Norma. “I’ve made lots of new friends and it has given me the opportunity to take part in lots of activities I would never have attempted. Project organisers tell us that they’ve learned a lot about how to train, motivate and retain volunteers and that this has led to greater self-confidence in volunteers and trainers alike. Our programme evaluation, by Ecorys & Keele University Centre for Social Gerontology, has produced robust evidence to demonstrate the long-term benefits of investing in activities for older people which improve health and mental wellbeing. Findings on various themes including volunteering are now available from the Fit as a Fiddle website. To find out more about Big Lottery Fund’s evaluation of the Well-being programme across England, visit our Evaluating Well-being webpages. What do you think of Flavia’s guest blog? Have you been involved in the Fit as a Fiddle programme and have a story to tell? Leave your comments below or join the discussion on Twitter using #biglf. Our Centre for Ageing Better will invest £50 million to look at what works in helping people have a rewarding old age. A £70 million investment will also address social isolation among older people. Reblogged this on Birmingham South Community Safety Partnership. Thank-you for all the info.